A couple of weeks ago, Becky and Co., Krissy & Co., my parents, and Charlie and I headed down to the Branson area in Missouri to spend four glorious days on a houseboat on Table Rock Lake. My sisters and I have been looking forward to the trip since the beginning of the year and really had to restrain ourselves from shopping for vacation stuff in February. Charlie was not looking forward to the long drive. 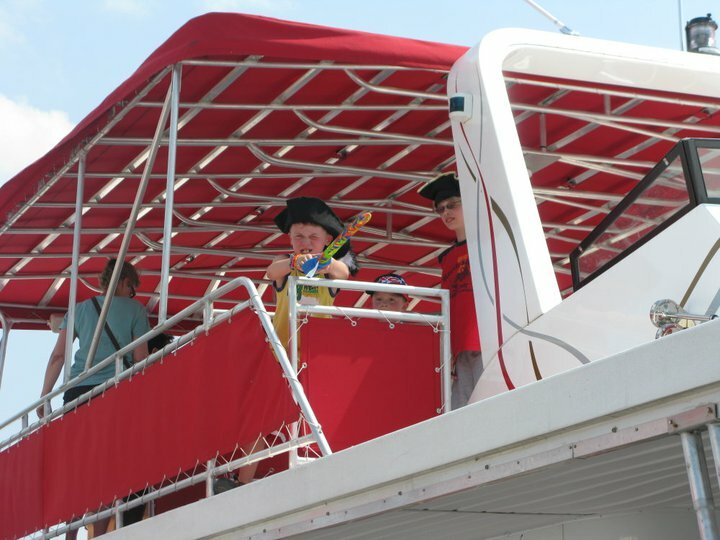 The Great Pirate Gavin laying claim to the houseboat. A few days before the trip, Charlie and I took a look at the map (mapquest) and mapped out our route. Charlie didn’t really want to spend the entire day on the road, so we decided to stay overnight in Kansas City, Mo. (more accurately, we found a nice and inexpensive hotel in Overland Park, Kansas). The drive to Kansas City wasn’t bad at all. I slept for a few hours, and Charlie was happy listening to “This American Life” and the audiobook of “Bossypants” by Tina Fey (hilarious, by the way — I heart Tina Fey). 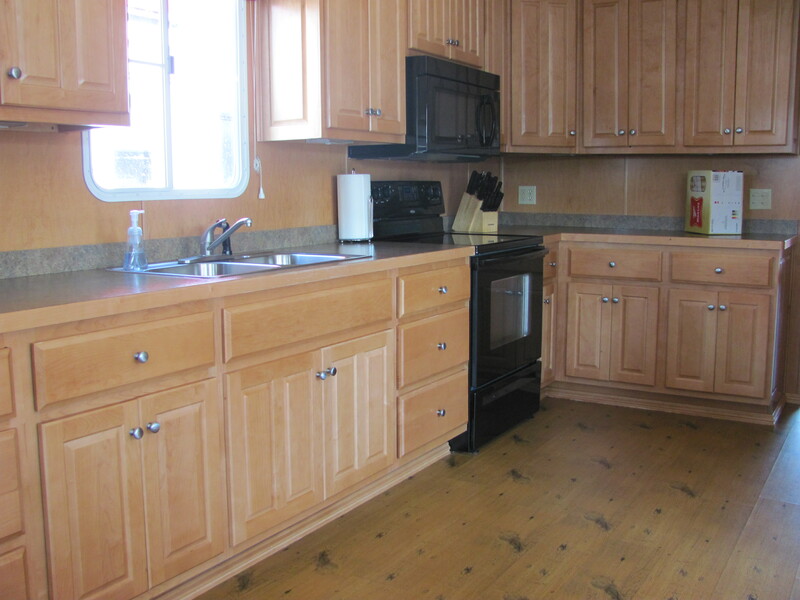 The lovely kitchen area of the boat. Although the company of the houseboat furnished a lot of kitchen supplies -- plates, cups, pots, pans, etc. -- the one item my sisters and I forgot were paper plates. But we were also all OK with washing the plates after each meal -- not too big of a deal, I guess. Before boarding the boat, the entire family met for lunch at a popular restaurant called Lambert’s in Ozark, Mo. The staff throw hot dinner rolls to customers (seriously, they throw the rolls and you need to catch them — I caught a couple) and carry big pots of a variety of sides (black eyed peas, fried okra, etc.). And the drinks come in gigantic plastic mugs — no refills are necessary because size is just huge! Lambert’s was a place to experience, but I don’t necessarily need to go back. 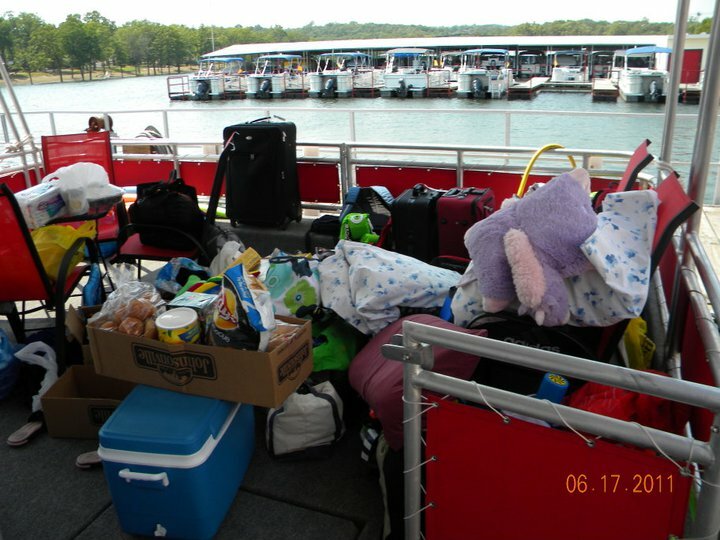 Four families equal a lot of stuff needed to spend four days on a houseboat. During the drive down, I was freaking out about forgetting something -- so I don't know how Becky and Krissy can remember stuff for themselves AND their kids. Look! I can touch the ceiling! 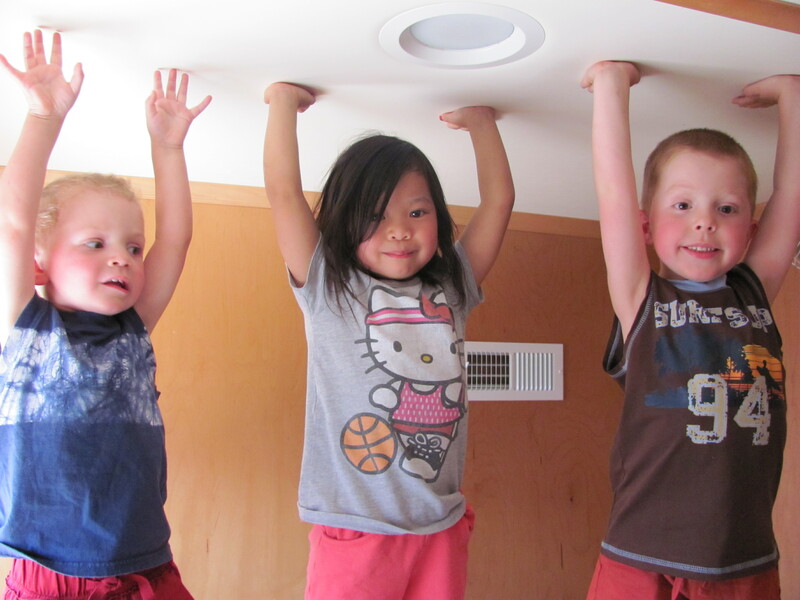 Tate, Tova, and Cole discover the joys of standing on a bed in the houseboat. Once we found temporary storage for all the food (in two SUVs and one minivan), we headed down to Kimberling City, Mo., where our houseboat awaited us. The staff were amazing — they helped us load all of our stuff from our cars onto the boat. Jason, Pat, Charlie, and Krissy were given a crash course on how to operate the boat. Apparently, no one trusted me to drive the boat — seriously, what could go wrong with me driving a houseboat? Nothing, I tell you, nothing! A staff member steered the boat out of the marina area, which was kind of tightly docked, and handed the wheel over to one of the guys and stepped onto a boat that followed us. From there on, the houseboat was ours. 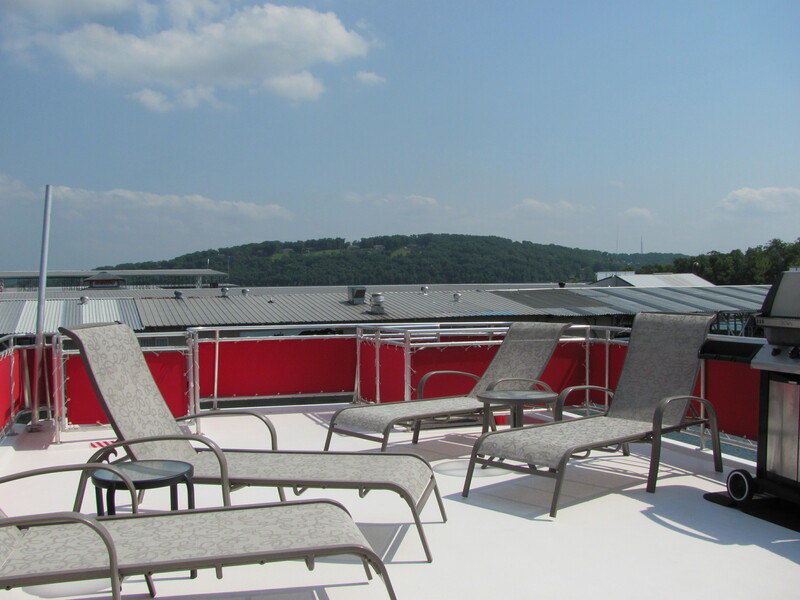 The top deck of the boat complete with lounge chairs. I think I need another post to finish the vacation story. With added commentary and pictures, this post is surprisingly long. I want to make sure I remember everything about the trip because it was so important to me, my sisters, and my parents. I want to look back on the post and say, “I remember that.” And then smile at the memories. So, stay tuned for HAPPINESS ON A HOUSEBOAT: PART II.